The GDL Genesee Valley library branch is located in a corridor off the Sears wing. Below, this photo shows last year’s flooding. No photos were available for the most recent problem. FLINT TWP. 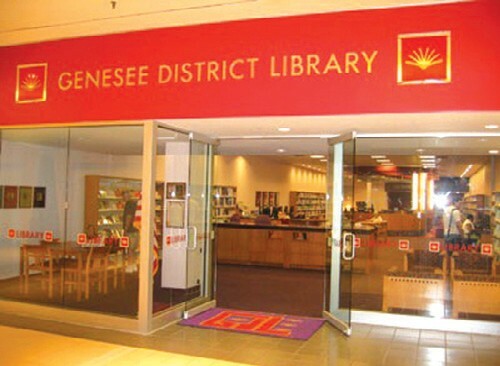 — For the second time in less than a year, the Genesee Valley branch of the Genesee District Library is closed due to flooding caused by faulty water pipes. The flooding occurred on Thursday, Jan. 9, the same day the Flint area hit a record-breaking minus 21 degrees on the tail end of a three-day subzero freeze. 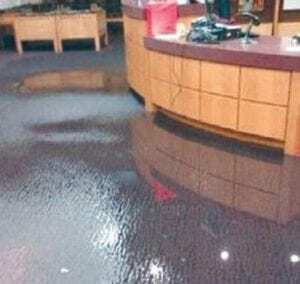 One library spokesperson said that flooding damage is worse this time than it was in late January 2013 when a broken water main caused flooding that closed the facility for several weeks. Ed McHale, GV mall General Manager, said in a statement that the most recent flooding episode is unrelated to the previous incident. He attributed the problem to frozen pipes and extremely cold temperatures that were experienced at several locations throughout the mall. As of Monday, he said that all repairs had been completed and other affected mall tenants were reopened for business as usual. Apparently, it wll take a bit longer for the library, which is carpeted, to dry out. “We expect the Genesee Valley Branch to be closed for a minimum of two weeks while our teams respond to this crisis..” said David Conklin, GDL director, in an official media statement. 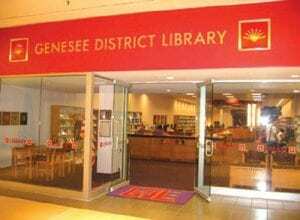 “The Genesee District Library (GDL) is extremely disappointed in the recent pipe burst in the mall which resulted in significant flooding to its Genesee Valley Branch location,’’ he said. As of Sunday, a sign posted in front of the library’s doors informed patrons that it is closed due to flooding and provided directions to other nearby branches. Yellow caution tape was stretched across the front along with a ServPro sign indicating the presence of a clean-up crew. Carpet drying fans were seen humming inside. The GDL branch is located in the Sears corridor near an outside entrance facing Linden Road. It offers to the 26 computers for public use as well as copy service and free Wi-fi. GDL operates 19 sites throughout the county. The closest one to the mall location is the McCarty branch adjacent to the Flint Township Senior Citizen Center, 2071 South Graham Road. Operating hours are 10 a.m. to 6 p.m. Monday and Wednesday, noon to 8 p.m., Tuesday and Thursday, 9 a.m. to 5 p.m. Saturday and closed Friday and Sunday. Other branches are located in Swartz Creek, Grand Blanc, Flushing, Mt. Morris, Burton, Davison, Forest Township, Fenton, Beecher, Clio, Linden, Gaines, Goodrich, Mt. Morris and Montrose. Operating hours and services are posted on the GDL website at www.thegdl.org. More than one million patrons use the GDL annually.